← Kel’s Buffalo Shrimp with the Best Bleu Cheese Dressing Ever! Brad and I recently took a trip to one of my favorite southern cities (actually, make that all cities), Charleston, S.C., for the 15th anniversary of our first date. How romantic! The weather goddesses smiled upon us and we had an awesome time. From excellent accommodations, fun rooftop bars, top-rated cuisine, historic sightseeing, a side trip to Savannah and a chance meeting with my cousin Brian, whom I hadn’t seen for 20 years, this was a perfect trip that I will always cherish. Thank you, Brad, you rock! Okay, let’s start with our most excellent accommodations at the Harbourview Inn. 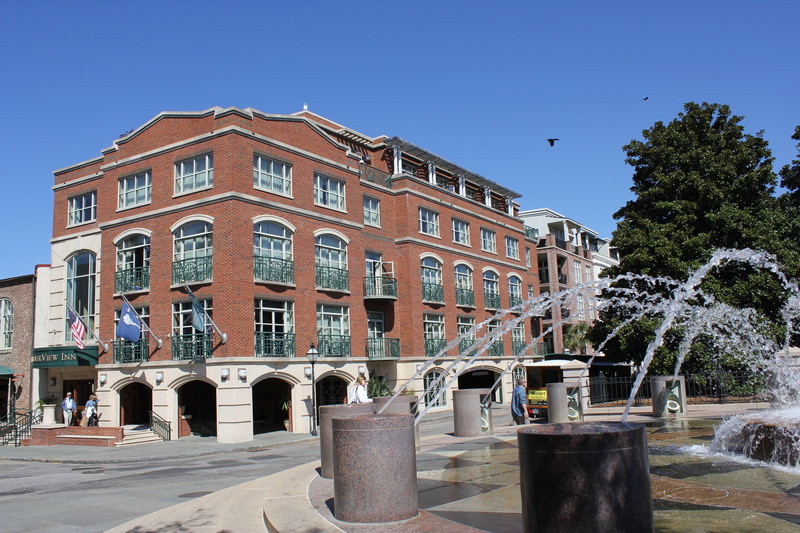 According to its website, the Harbourview’s “downtown Charleston location provides the perfect base for the culinary curious.” It certainly does. There are numerous excellent restaurants in walking distance that you’ll have a hard time deciding among them. 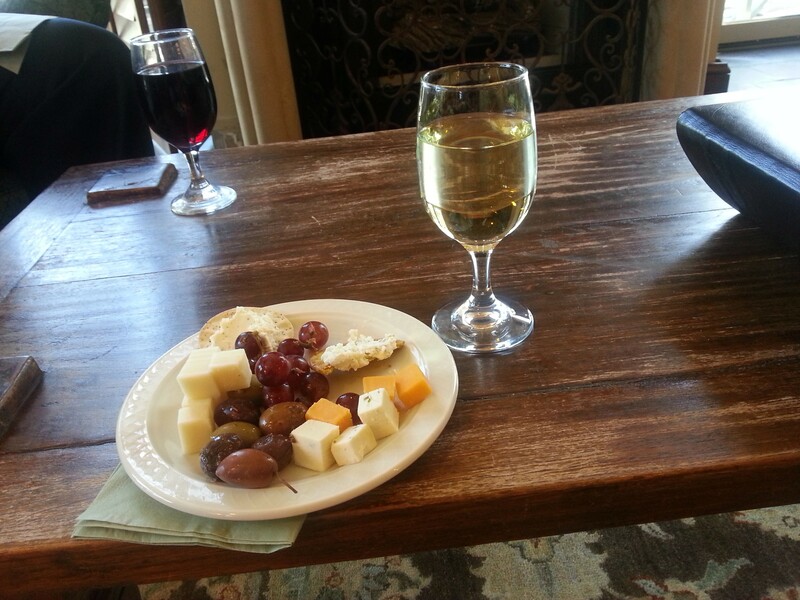 Each afternoon at the Harbourview there’s a really nice wine and cheese reception in the atrium lobby. At night there are freshly baked cookies and milk, oh yeah! Our inn package came with breakfast delivered to our room each morning (yogurt, pastries, cereal, juice, etc. – there was a menu to choose from each day.) Fruit-flavored water, which is such a great Southern touch, and endless M&Ms (plain and peanut) were available all day in the lobby. 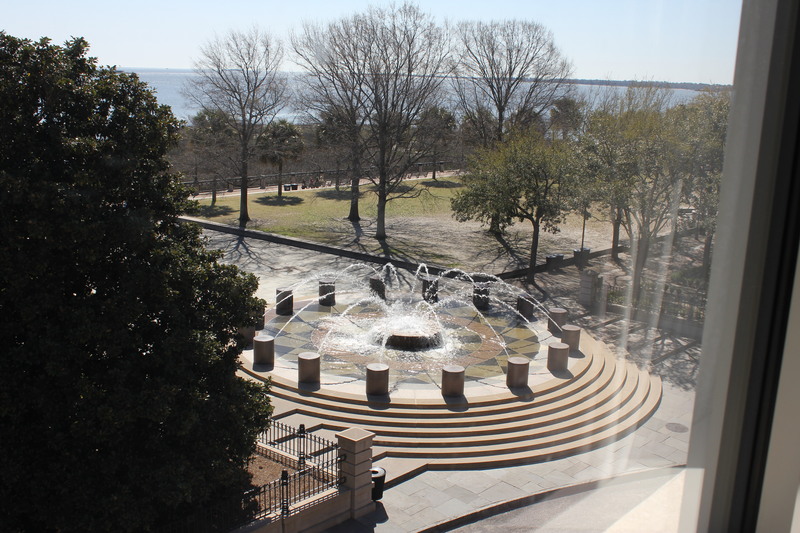 The rooms are classy and well-appointed (water view is recommended, as pictured below!) There’s a great rooftop with lounge chairs — perfect for enjoying the sun and the views. We took our wine and cheese up there a few times. This is definitely my favorite hotel in Charleston! 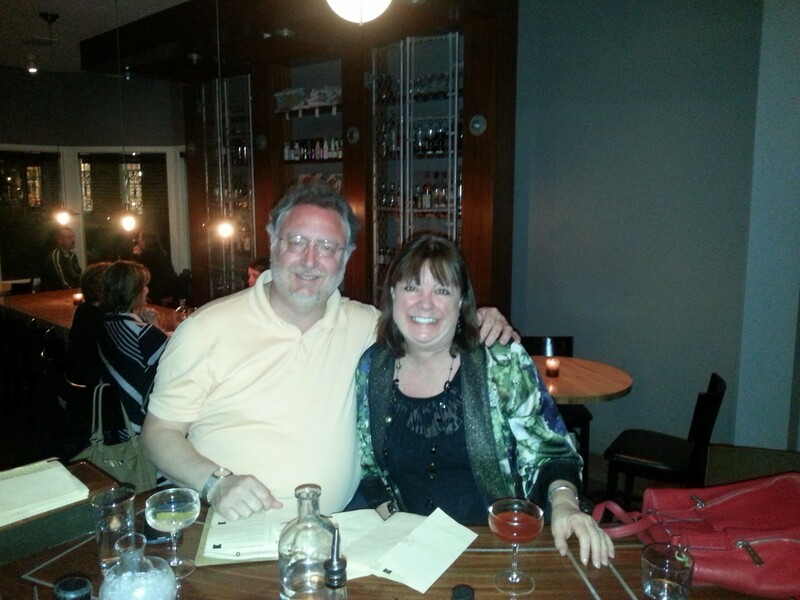 So on to Charleston’s acclaimed restaurants and bars, of which there is no shortage. Here’s a kind of short review of my latest stay. High Cotton. We ate here our first night in Charleston. 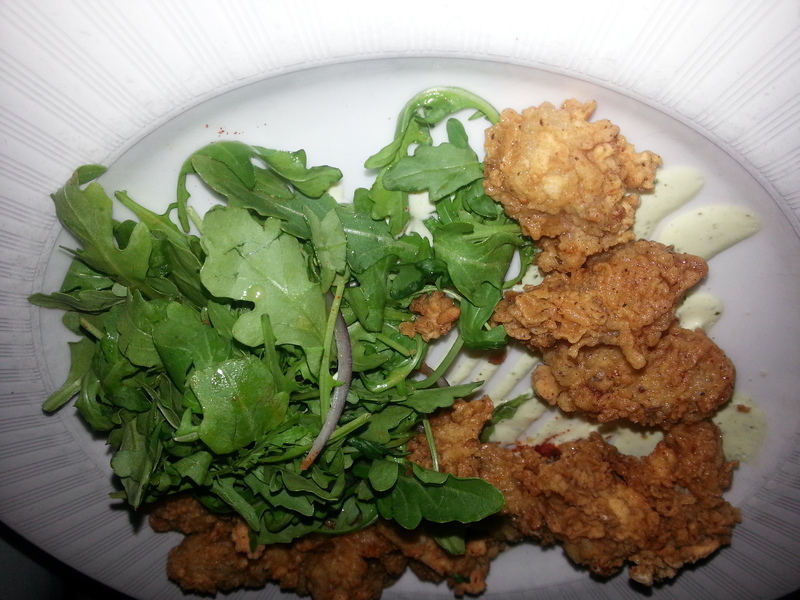 After loading up on cheese (and wine) at the Harbourview, we decided just to get some appetizers, one of which was the buttermilk fried oysters ($17.00). These were perfectly breaded and cooked. I would definitely get these again There was a small band playing 70s-type soft rock that was quite good. 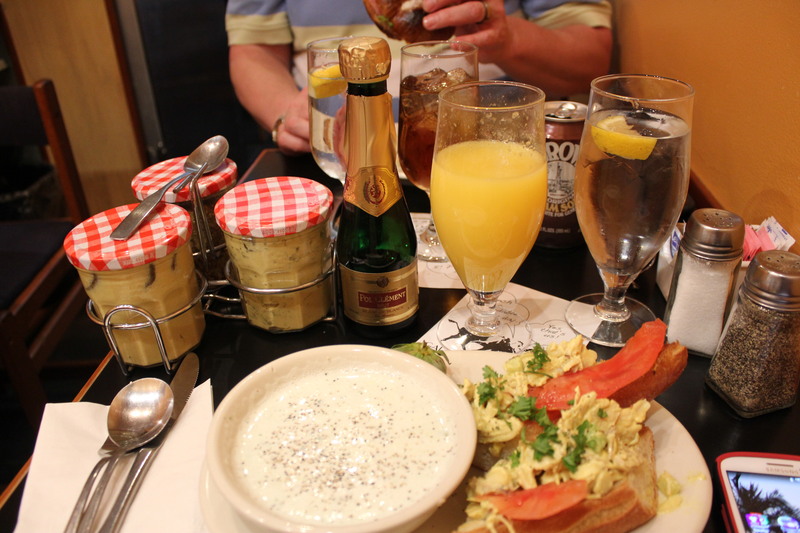 High Cotton is a sister restaurant to SNOB, one of my Charleston favs (see review below). Magnolias. Brad and I love, love, love Magnolias, especially for its housemade potato chips with crumbled blue cheese and scallions ($8.00). This appetizer is a definite must — trust me on this one. 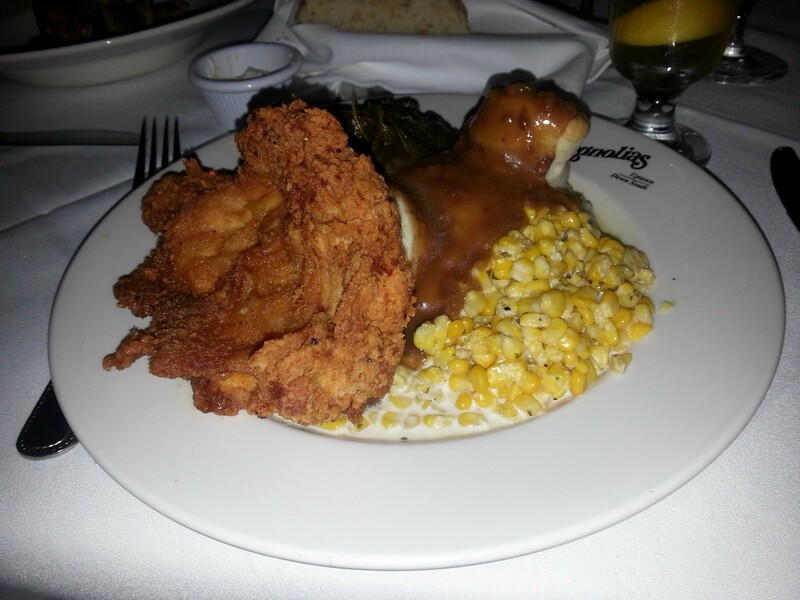 And also trust me on Magnolias’ buttermilk fried chicken breast— it is to die for. It comes with cracked pepper biscuits, mashed potatoes, collard greens, creamed corn and sausage-herb gravy ($19.00) Since I’ve been home I’ve tried to duplicate creamed corn, and I finally created a recipe that I hope you will find worthy. 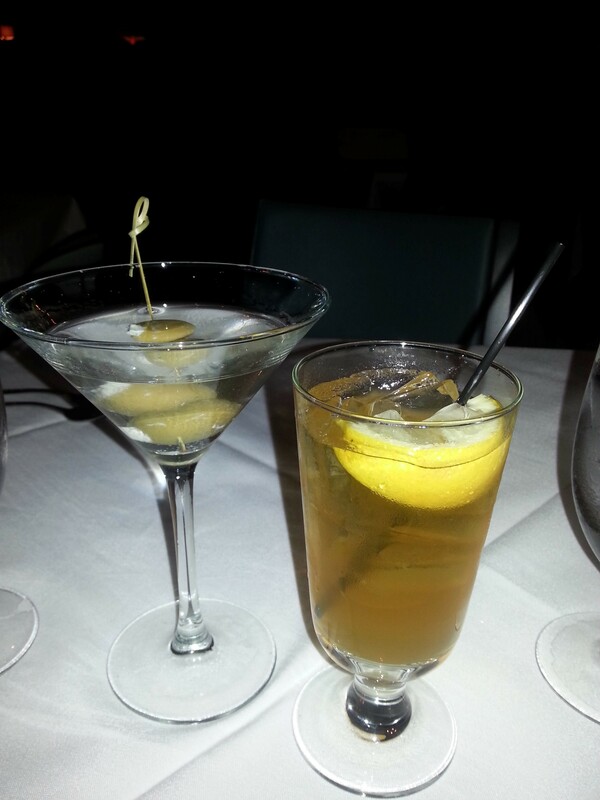 I also tried a cocktail called the Arnold Palmer (I think) with Firefly sweet tea vodka and lemonade. What a nice and refreshing drink, especially since I love iced tea and lemonade. Brad had an extremely dry Grey Goose Martini with bleu-cheese-stuffed olives. SNOB (Slightly North of Broad). 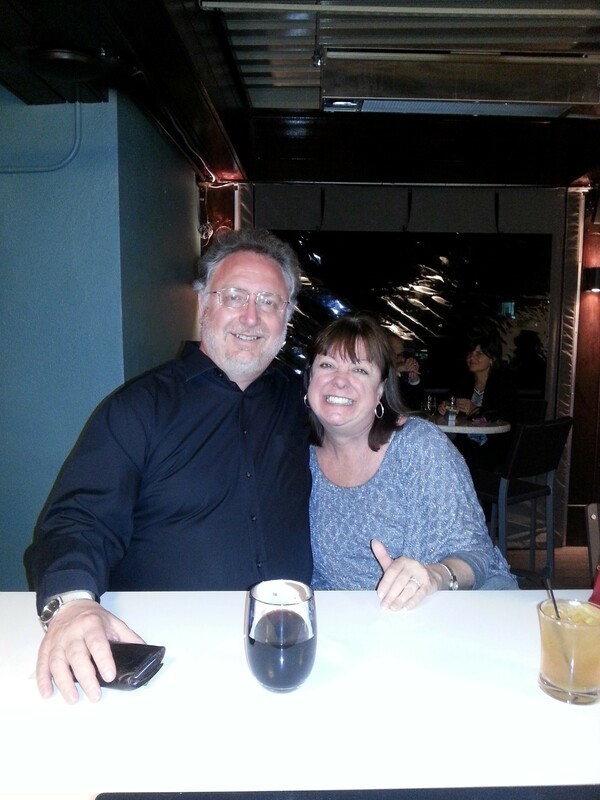 We were treated like royalty at SNOB since it was our anniversary. That being said, the service here has always been stellar, including a chef’s table dining experience several years ago with dear friends Rose and Steve. With major kudos to all of the staff, the food is the shining star here. SNOB has the best shrimp and grits ever. Ever. 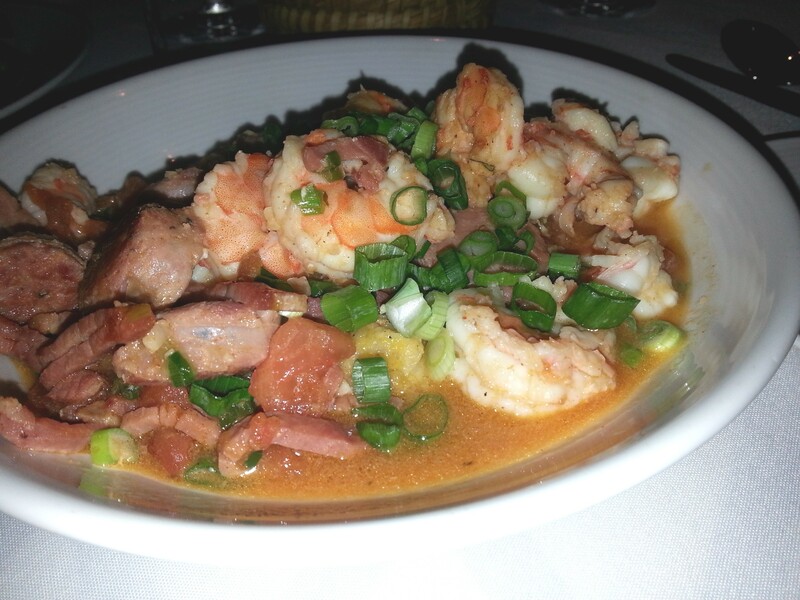 These are prepared with sautéed shrimp, sausage, country ham, fresh tomatoes, green onions, garlic and Geechie Boy yellow grits ($26.00) and you will savour each delectable bite. 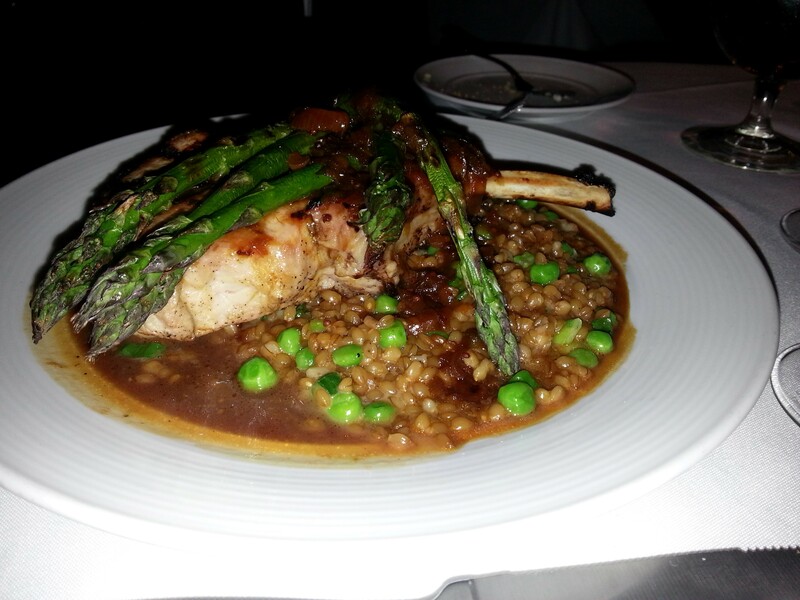 Brad enjoyed a delicious pork chop with grilled asparagus, etc. 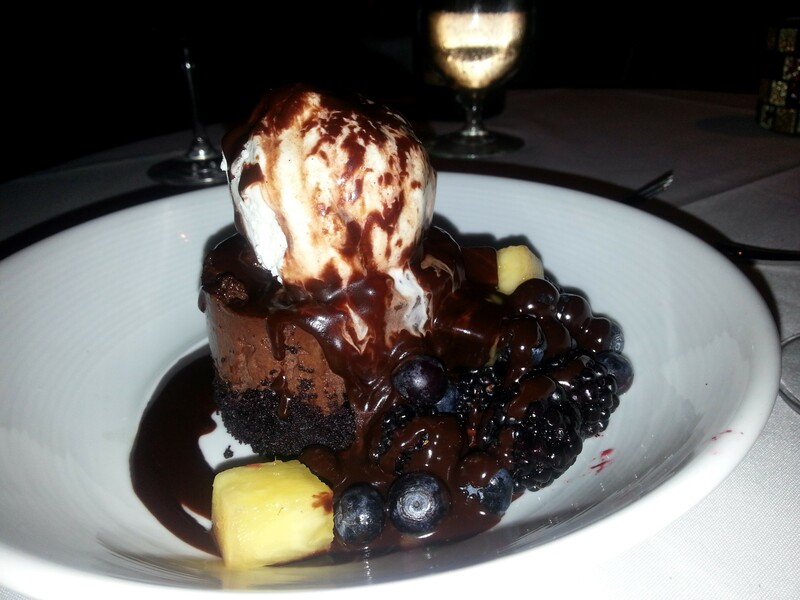 We split a devil chocolate mousse cake for dessert. OMG. OMG. Social Restaurant and Wine Bar. This was the first time Brad and I visited this wonderful place, which was right down the street from the Harbourview and opened in 2007. It’s cozy and warm, with friendly bar staff. We decided to grab a pizza here the night we returned from Savannah (more about that side trip later.) 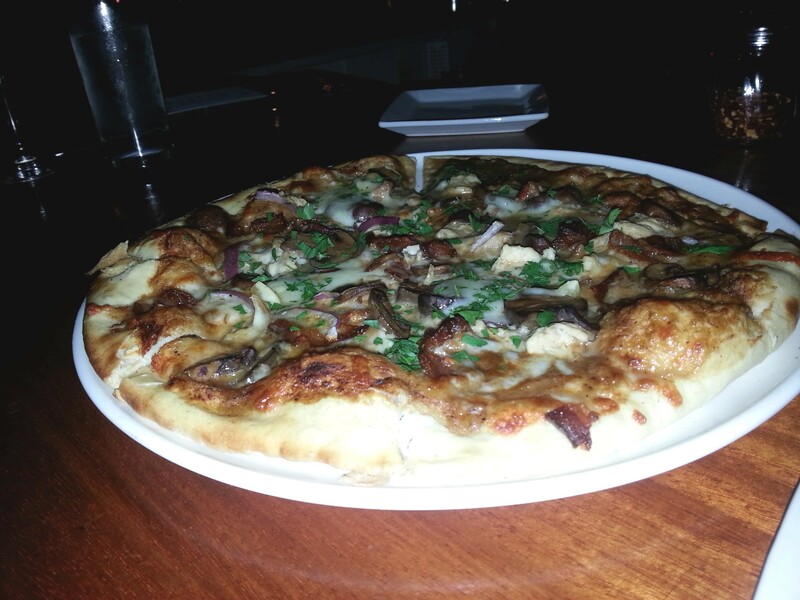 We ordered the Coq Au Vin pie ($17.00) which has braised chicken, bacon, mushrooms, red onion and Gruyère. It was so good! 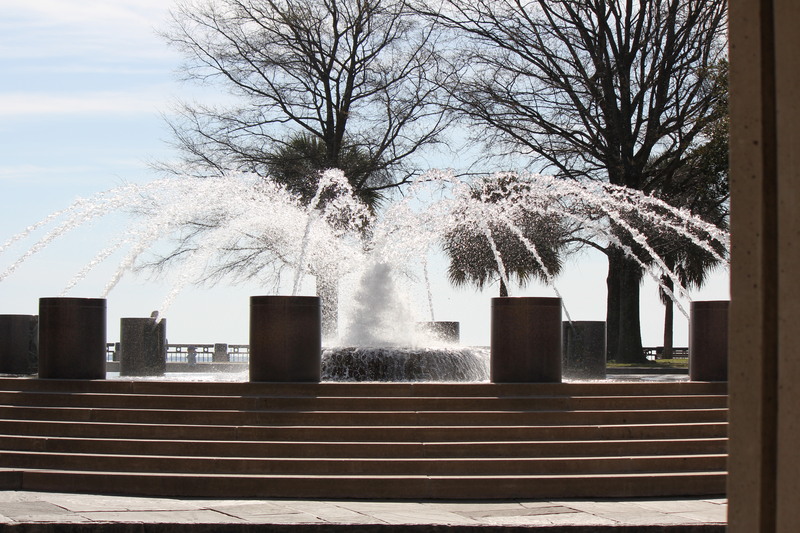 This a great place to relax and enjoy a nice glass of wine after visiting Charleston’s City Market. Blind Tiger Pub. On one of our first visits to this sassy little bar several years ago, Brad and I were enjoying late afternoon cocktails here when a pre-wedding party of men in perfect black formal tuxes (think old-money Charleston here) came in and threw down lots of draft beer, shots and a few (okay, many) cocktails before departing to a gorgeous church up the street. I hoped the bridal party was sipping expensive champagne and doing a few shots themselves. But I digress. Brad and I enjoyed lunch here outside on Blind Tiger’s patio. 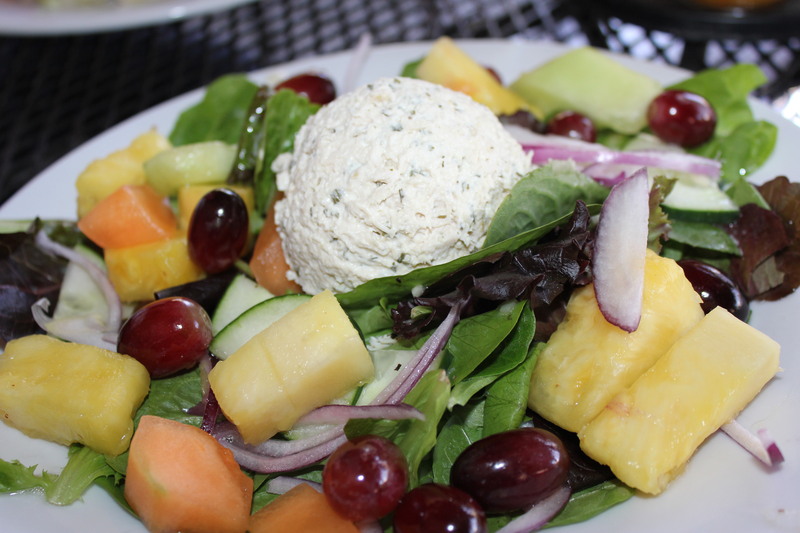 I got the chicken salad plate, which was refreshing and good – lots of food. Brad enjoyed his tiger tacos, with ahi tuna, cucumber salsa, romaine and feta cheese. A local favorite that I visit at least once each time I visit Charleston. 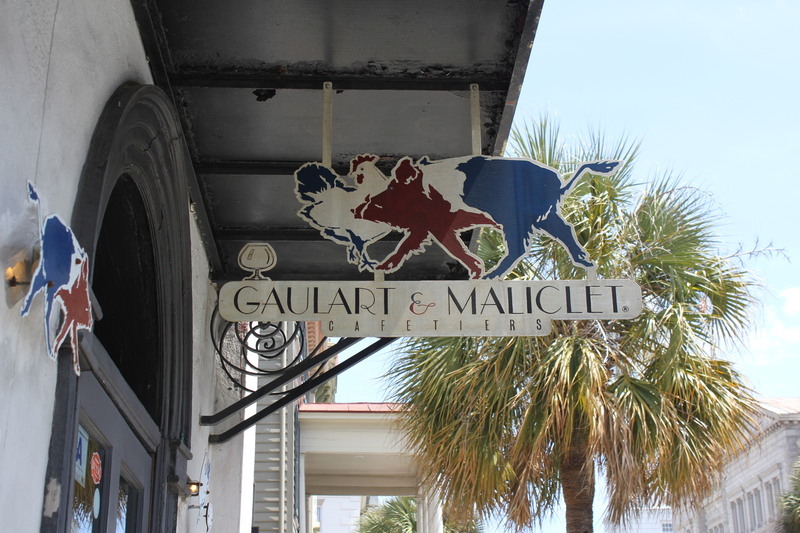 Gaulart & Maliclet French Café. Brad took me to G&M on our first visit to Charleston more than a decade ago and we always go back whenever we visit. Why? Because it is awesome, period. Another local favorite for sure, somewhat off the beaten track, with fantastic food. Go early or go late, but just go. If you have a large party (more than 2) you may not get to sit together. Get over it and split up — trust me on this one. This is where I savored the best chilled cucumber melon soup ever. Ever! On this trip we got seated in record time, but in the back to a new area (with one booth and one two-top) that I think was converted from a storage area or something. No worries, even though couldn’t really see what was going on with the locals. Still the same great food! And I scored — my favorite cuke and melon soup was on the menu and was just as wonderful as I remembered. I ordered the curried chicken salad sandwich (which was on special) and it was good. This is a must visit whenever I’m in Charleston! Gin Joint – Jerry J., this one’s for you. I know you would like this place (small bar, intimate seating in the dining area, plus outside seating in an enclosed patio.) Well of course you would, it has several fun gin cocktails to enjoy, like the Hot Head, which consisted of red chili gin, lemon, Luxardo maraschino, campari, cherry Heering ($10.) Refreshing, but a tad on the sweet side, however with a nice bite. Or else just get serious and order a traditional martini — light (no) vermouth, but please add a twist of lime and an onion or two. Okay, let’s move on to rooftop bars. You can’t go to Charleston without enjoying one of its rooftop bars. Luckily, there are two of them in extremely close proximity to the Harbourview. 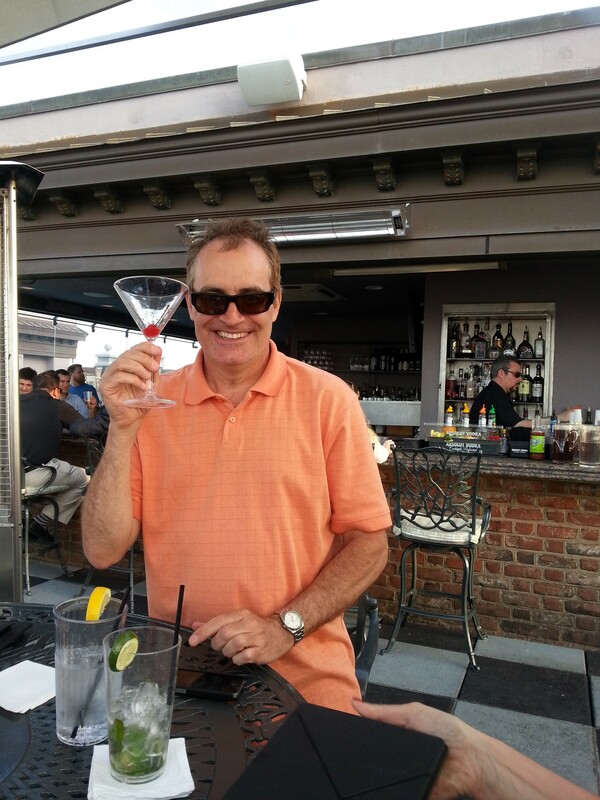 The Market Pavillion’s rooftop bar has an awesome view of the famous Arthur Ravenel Jr. bridge and is a fun place to visit. 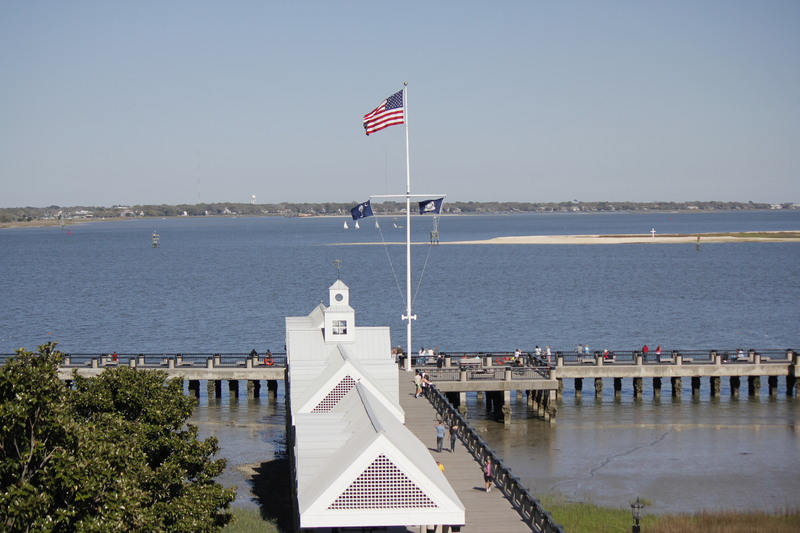 We’ve been enjoying the views here since our first Charleston visit. This visit to this rooftop turned totally cool because I caught up with my cousin Brian and his s/o Cathy, who were vacationing from northern Virginia. I hadn’t seen Brian in at least 20 years. Thank you, Face Book – they saw we were there from my check-ins. Awesome! We had some cocktails and great conversation. One of my highlights of our trip. It’s a small world indeed! Vendue’s rooftop bar was closed due to renovations when we first arrived in Charleston, but luckily re-opened on our dating anniversary. The rest of the place was in massive disarray, but I think there was a rush to get it up and running for the upcoming Cooper Bridge race on Saturday. Anyway, loved the new white bar, never seen one like it. Can’t wait to go back! Brad and I decided to take a day trip (2 hrs. or so) to Savannah, since neither of us had ever been before (hard to believe, isn’t it?) We planned to get there right before for lunch, and our timing was perfect. 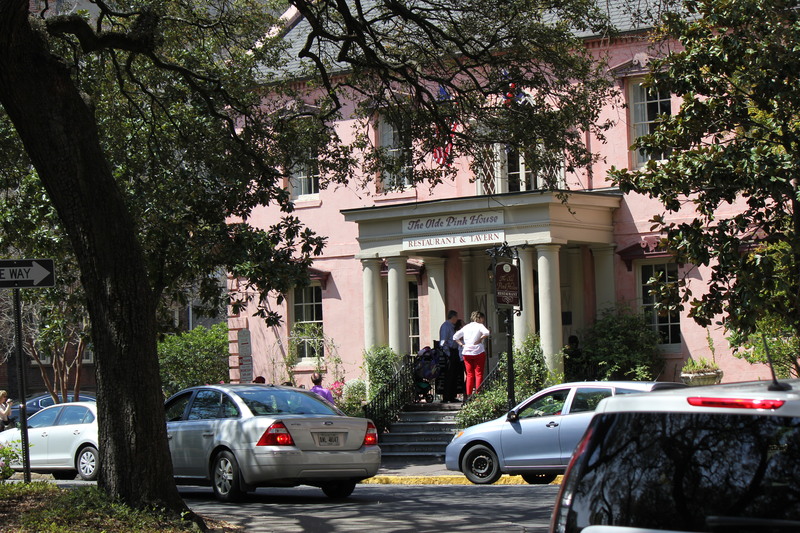 After consulting a number of online reviews on Urban Spoon, Yelp and Trip Advisor, we decided on The Olde Pink House, which got many great comments. Great choice, we were not disappointed. The Olde Pink House. We were told it would be a 40-45 minute wait, which was fine. 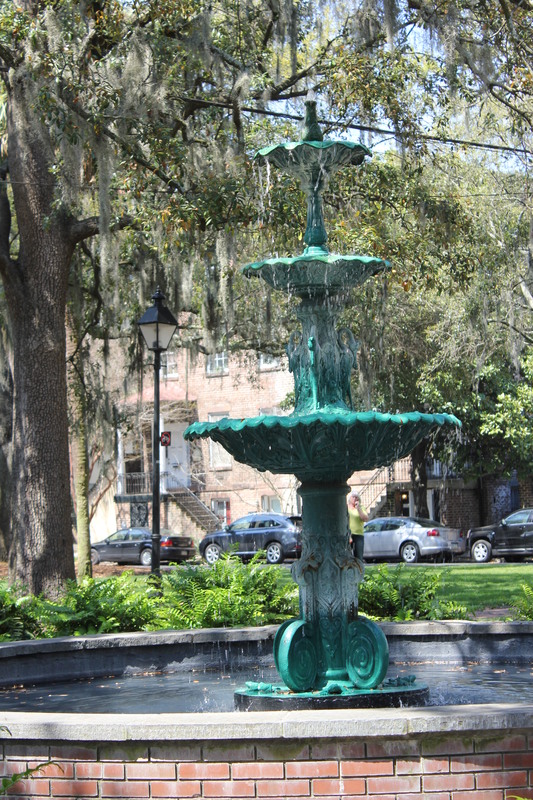 We wound up going to a little park right across the street and admired statues, Spanish moss and most beautiful azaleas in full glorious bloom. It turned out to be a 25 minute wait, which was good. I got the crab cake, which was to die for. 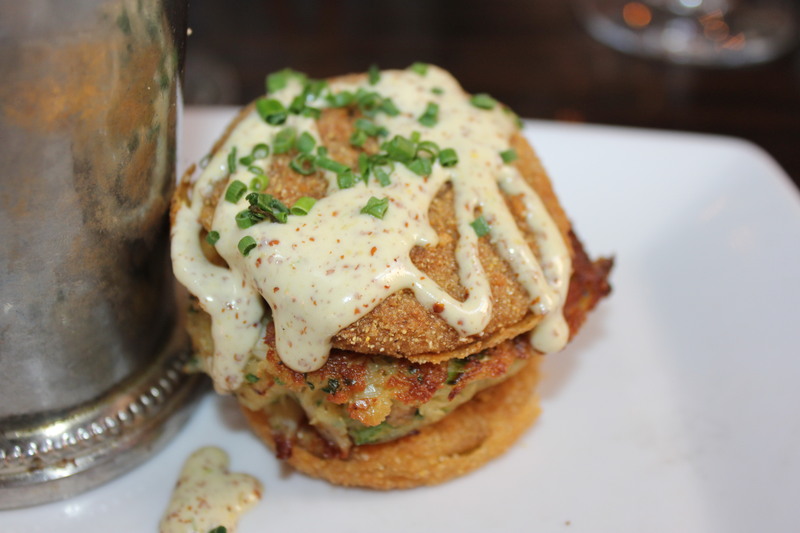 It was nestled between two perfectly fried green tomatoes. Little filler, awesome crab cake. The problem? None, I just needed more of them. Get this if you love crab. Seriously, get this. Brad got the gumbo, which he loved. This is a quaint and popular place and I will absolutely go back. 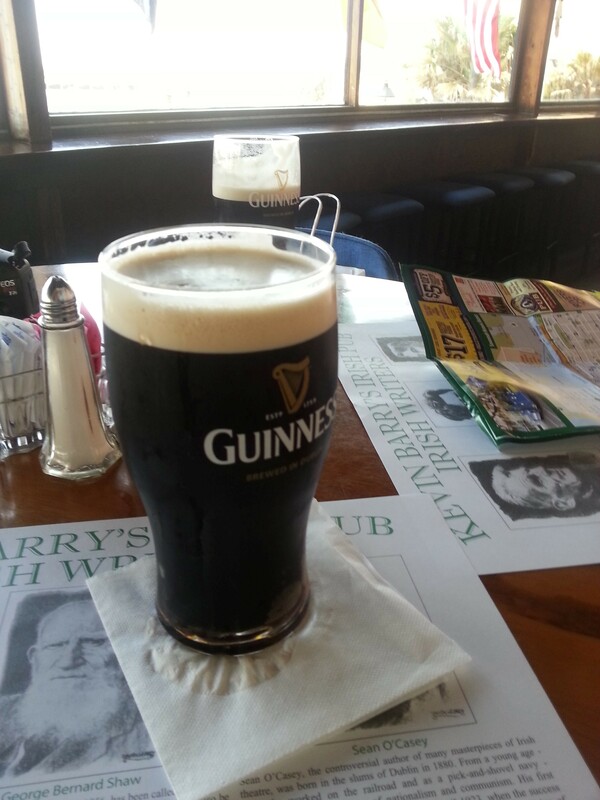 Kevin Barry’s Irish Pub. We stopped here for a Guinness (it’s good for you, you know) while walking along Savannah’s waterfront. We sat outside with a great water view and had friendly service. So there you go, a small glimpse of Charleston and even tinier slice of Savannah. There are so many dining options in both places and several in Charleston that I’ve been to before that I just couldn’t visit on this trip. Sounds like a great reason to go back soon and do a Part 2 of this post soon! This entry was posted in My Favs, Restaurant Reviews and tagged Charleston SC restaurant reviews, Charleston SC reviews, eat drink and be merry, Harbourview Charleston SC review, Kel's Cafe restaurant reviews, Magnolias Charleston SC revies, SNOB reviewxs, The Olde Pink House Savannah review. Bookmark the permalink. I will definitely bookmark this for my trip in Sept. I love Savannah, I’ve only been once, but it was fun! Great! Do you know where you’re staying yet? No, but I’ll let you know when I find out. I was thinking I might at least try Harbourview for the Fri and Sat I’ll be there.